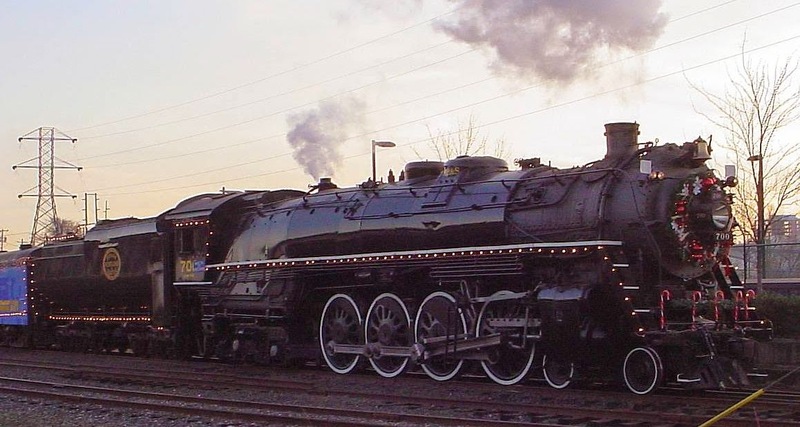 Before we begin, as a benchmark, the Big Boy class measured just short of 133 feet long, weighed 1,208,750 pounds, averaged about 6,100 horsepower at speed. For additional comparison purposes, the most powerful diesel engine was the EMD DDA40X, with 6600 horsepower. This class was also the longest and heaviest, at 98 feet and 521,980 pounds. Also, note that for brevity’s sake, I have focused only on the locomotives that were top contenders in each of the categories. All of these were built and operated in the United States, so I am not intentionally overlooking the rest of the world. The most straightforward way to crown a class of locomotives with the title of “largest” is to measure it from the tip of the tender, to the rear knuckle on the tender. Height does not factor into these calculations, since all locomotives, past and present, are limited by existing railroad structures to a height of about sixteen feet. Length is a concrete measurement, other than the fact that the largest articulated locomotives could contract and expand up to a foot at their joints. Even in the smallest locomotives, the joint between the tender and the engine can be quite dynamic around curves and up and down hills. Jawn Henry prototype next to a J-class. 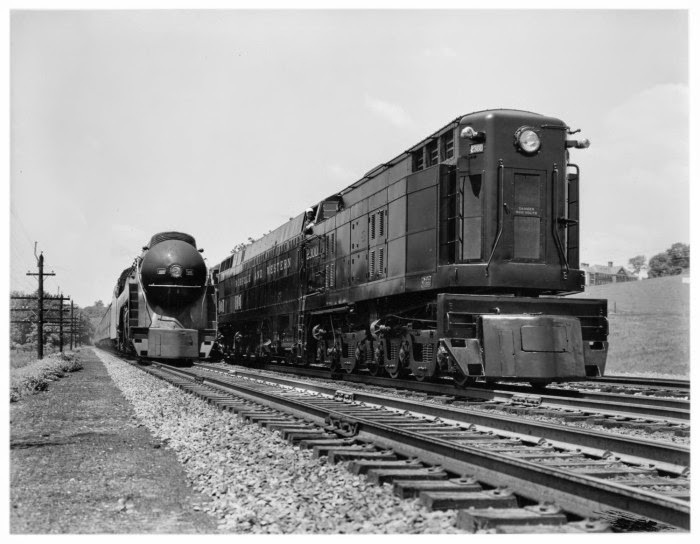 The longest class of locomotive ever built was the Norfolk & Western’s “Jawn Henry” steam- electric turbine prototype, which measured in at a massive 166 feet. The Chesapeak and Ohio’s M1 turbine, was a close contender, at 154 feet in length, as was as the Pennsylvania Railroad’s failed S1 class at slightly more than 140 feet.By these measurements, the Big Boy lacked 33 feet on the Jawn Henry class and come in fourth in terms of length. However, the three longest models were all prototypes. The railroads that owned them ordered only a handful of each class, and assigned them to very limited road service. In contrast, the Union Pacific ordered twenty five Big Boys, and used each of them frequently. This will be a recurring theme in most of the categories yet to be discussed, and is likely the reason that the Big Boys are often called the "largest" even though a few individual locomotives may surpass them in measures of size and strength. Measuring the weight of a steam locomotive is less concrete than determining its weight. Back in the age of steam, there was no standard among locomotive manufacturers whether the figures they gave as a classes weight were an empty or filled weight. Furthermore, both numbers are, at best, an estimate. In practice, steam locomotives are almost never completely full or empty, and its weight changes constantly during the course of its working day as the crew used and replenished its water and fuel. Even a few inches’ change in water or fuel levels can translate into hundreds of pounds lost or gained. 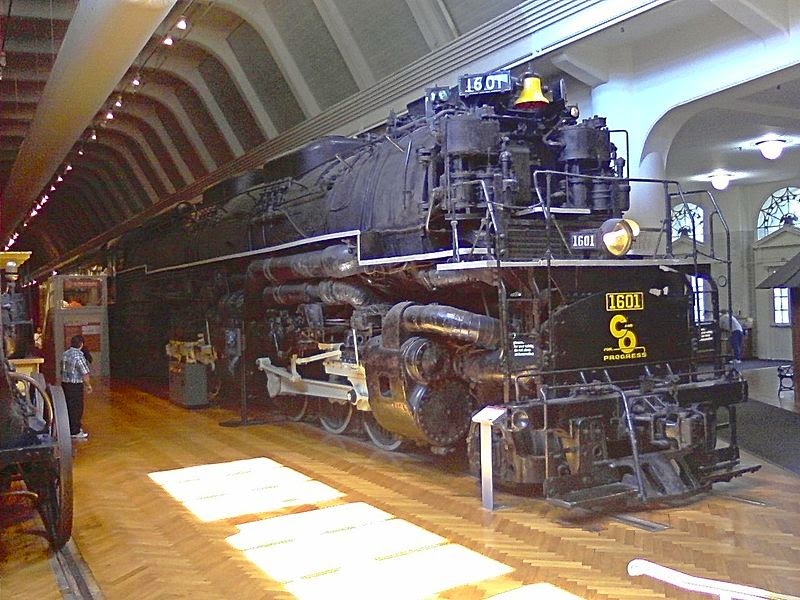 Going by measurements in which the boiler is assumed to be full, but the tender is assumed to be empty, the C&O M1 at 1,233,970 pounds class is the heaviest steam locomotive. The Big Boy class came in second, closely tailed by the Virginian AG “Allegenhy" class at 1,195,000 pounds. Some people prefer to exclude the tender when determining weight and length, by which reckoning the M1 still comes out the heaviest, but I prefer a combined weight since a steam locomotive cannot function without its tender. It is significantly more difficult to determine how strong a locomotive is than to get a sense of its mass. In modern times, a vehicle’s strength is typically described by horsepower, but for a steam locomotive, that is a less than idea measurement. The efficiency of a steam locomotive can be quite variable during active service. Poor fuel and water quality, an unskilled fireman, or difficult operating conditions can cause it to run at a far lower horsepower than it is capable of reaching under ideal circumstances. A steam locomotive’s highest horsepower is also calculated at its most efficient cruising speed, usually somewhere between forty and sixty miles per hour. This calculation does not take into account their great difficulty in starting a heavy train from a standstill. This drawback forced most locomotive classes to either use a helper engine, or operate trains that were lighter than their theoretical horsepower rating could have handled. Lastly, not all of the horsepower than an engine produced was actually transferred into moving locomotive and the cargo hooked up behind. Many external factors, such as whether or not the train is on a slop, whether the condition of the tracks prevents good adhesion, or the condition of the brakes and other steam-powered components can siphon away power that would otherwise be applied to moving the train. The Q-2. In this picture, some streamlining around the running gear has been removed. The Pennsylvania Railroad Q2 class reached a horsepower of 7987 in static testing--the highest ever recorded of any steam locomotive. With 26 different locomotives of this class built, the Q2s were the most successful duplex locomotive--that is, two pairs of pistons attached directly to a rigid frame--but were withdrawn within a decade due to their increased maintenance requirements. C&O Allegheny # 1601. Note the scale of the early locomotive to its left. The Chesapeake & Ohio’s articulated H8 or ‘Allegheny’ class, with a top horsepower of up to 7,498, was far more successful as a working locomotive They were designed to tackle the same geographic challenges that necessitated the Big Boys: pulling heavy coal trains over mountains. Sixty of these locomotives ran in service from 1941 up until the end of steam, and two still exist on static display in the present. When steam was unchallenged as a source of motive power, railroad managers preferred the concept of “tractive effort” to determine a locomotive’s strength. This theoretical calculation took into account boiler pressure, piston size, and wheel diameter to determine the maximum power that could be drawn out of an individual class of locomotive. Tractive force removed the uncertainty inherent to attempting to move horsepower, and allowed crews to more effectively determine the maximum cargo weight that a locomotive could pull. The Jawn Henry class, again, comes in the winner, with a tractive force calculated at 180,000. The Virginan's XA triplex class came in second at 166,000, but the class never saw road service as it could not travel more than five miles per hour without overwhelming the boiler's capacity. In this category, there are almost a dozen classes of locomotives, most of them experimental, that have a higher tractive effort than the Big Boy's 135, 375. For a full statistical breakdown of the top contenders of in all categories, visit www.steamlocomotive.com. That most of the examples discussed here were experimental shows how creative the railroads had become when diesels began to challenge steam's preeminence.Many of the prototypical classes described here might have been developed into workable road models, had steam managed to compete for another decade or so. However, it is interesting to note that one of the reasons why steam fell out of favor was in the first place was that the demand on the railroads had required engines to grow to such massive sizes that they became difficult to operate on existing tracks and infrastructure. Many of these large classes could not fit on typically sized turntables or particularly tight curves, and they enacted such wear on the tracks structure that its components would have had to be replaced more often. Whether large in scale or small, operating steam is always a battle against its own self-destructive tendencies. *Since there are several different variant -models of 747s, their wing area ranges from 5,500 to 5963 square feet.